Growing throughout Europe, comfrey has been used to heal broken bones since ancient times. In the 1970s it became popular as a remedy for arthritis when taken internally, which led to extensive animal studies using the plant and a realisation that the alkaloids contained in the root may cause liver cancer. Since then it has been banned in a number of countries. 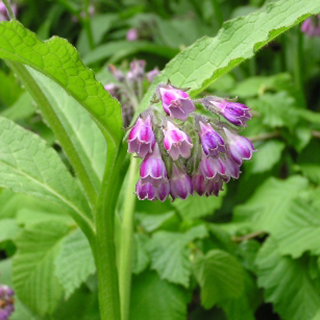 Comfrey speeds the healing of cuts, ulcerations, bruises, pulled muscles and ligaments, broken bones and sprains. Use night and morning to massage arthritic joints, sprains, bruises, and other traumatic injuries. Use on clean cuts and scrapes, or on skin sores such as diaper rash. Also useful for boils, acne, and psoriasis. Use puréed leaves as a poultice for minor breaks (broken toes, etc.) not normally set in a cast. Make a paste with powdered root and a little water, and use on varicose ulcers, stubborn wounds, or hemorrhoids. Apply a pad soaked in a standard decoction of the root to bruises and sprains. Prefers moist soil in a sunny or partially shaded site. Can be propagated from seed sown in autumn or spring, by root division in spring, or root cuttings in winter. Does not tolerate dry winters. Once established, it can be difficult to eradicate. Gather leaves and flowering tops in summer and roots in autumn.